Unfortunately LiPo battery safety wasn't exactly high on the list of priorities when we first began using them to power our RC airplanes. We've seen a lot of fires and destroyed homes because people used the wrong chargers, maybe tried to charge their batteries with too much current, or simply made the mistake of leaving their batteries charging unattended. There's no need to be scared of LiPo's. They are perfectly safe as long as you know what you are doing and you respect them. 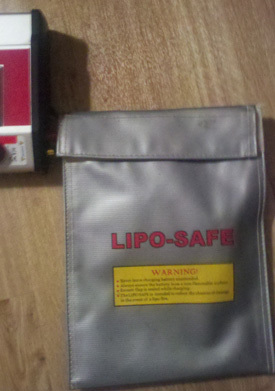 The majority of LiPo fires happen while charging the battery. If you're new to LiPo's, take a minute to follow this link to educate yourself about LiPo battery charging. LiPo fires usually happen when inexperienced modelers either use the wrong type of charger, use the wrong settings on their charger, or try to charge their batteries too quickly. Check out the video to the right to see exactly what happens when a LiPo battery is charged beyond a 1C charge rate. It's pretty spectacular. The kind of fireworks you DON'T want to see in your house or workshop! Following the below LiPo battery safety guidelines will greatly reduce the chances of having a fire. Always let your LiPo batteries cool to ambient temperature after a flight before charging. Make sure your charger is designed specifically for LiPo battery packs. Double check that your charger has counted the cells correctly and is charging at or below 1C charge rate. Always charge your batteries on a solid non-flammable surface in a well ventilated area. Always keep a fire extinguisher nearby while charging your LiPo batteries. 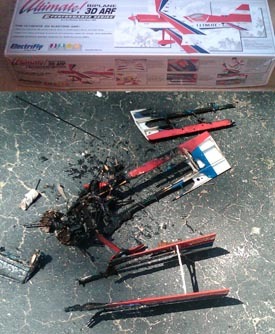 Always check your LiPo batteries for any damage after a crash. If the LiPo back is punctured or damaged in any way, don't use it. Never, under any circumstances, leave your batteries charging unattended. On very rare occasions a LiPo pack can catch fire even if you've done everything correctly. That's why it's good practice to use a fireproof LiPo charging bag. I always charge my batteries in the charging bag seen on the right. It's also very convenient for transporting batteries when going to the flying field. Charging bags are inexpensive and could potentially prevent your house from burning down. Consider them a very cheap form of home insurance! You can pick up charging bags on eBay for a little of nothing. Money well spent in my opinion. I learned the hard way that charging isn't the only time a LiPo battery can explode. The slightest puncture can literally transform your LiPo pack into a blowtorch. A few years ago I decided it was time to order my very first biplane. I decided on a small Great Planes Ultimate Bipe. My son was 5 years old at the time and spent the better part of two weeks in the garage with me putting this ARF together. It was a Saturday afternoon and I believe he was just as excited as I was to see her fly. The motor, radio and electronics were all installed. I had already adjusted the throws. All that was left was trimming the cowling just a little bit more so the battery would fit and we would be off to the flying field for the maiden flight. And then...I made the bonehead mistake of leaving the battery in place while trimming the cowling with an X-ACTO knife. The knife slipped and nicked the side of the battery. That's all it took. Flames were instantly shooting from the battery much like a blowtorch. My son was absolutely bawling as the crocodile tears come rolling down his face. He was literally in shock! I would have been crying too, but I had to be strong for him! I learned a tuff lesson about LiPo battery safety that. I share this story with you so that you will not become complacent with LiPo battery safety as I did. I can look back and laugh now. I'm very thankful that only the airplane was damaged. It could have easily been much worse. The bottom line? There's no need to be afraid of LiPo batteries. But it is critical that you RESPECT them by following the LiPo battery safety guidelines discussed above.